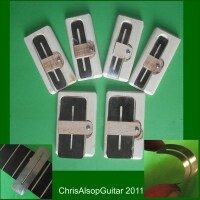 A selection of Fretboard Protectors/ Fingerboard Guards made from ULTRA THIN spring steel. The main property of spring steel is that it will ALWAYS RETURN TO A FLAT SHAPE. Other metals become bent and puckered so that you soon have a strip that prevents you having a smooth surface to work with. Being made of Spring Steel our strips ALWAYS SPRING BACK TO ORIGINAL SHAPE. Our strips are only 0.1mm thick , which is ultra thin for strips, so allows maximuim access to the frets. This dimension is very important. 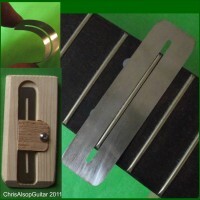 Other thicker strips will restrict the amount of fret exposed for working on. FREE: We include a set of sandpaper strips 800, 1000, 1200, 1500, 2000, 2500 grit. Each strip is approx 25mm by 280mm. These grits are used for crowning and polishing frets.